Initially, we’d planned just a single post looking at Farringdon as part of our (increasingly badly titled) London Terminals series, but John Bull’s recent wander through the old ‘Widened Lines’ tunnels east of Farringdon gave a brief glimpse of an unexpectedly cavernous subterranean world. This prompted us to ask: just how much more is down there? So we set about exploring, not least to find out what on earth JB was pointing his camera at. And the more we looked the more we uncovered – and the more we realised Farringdon needed to be treated as an area, encompassing Barbican, rather than just a station. 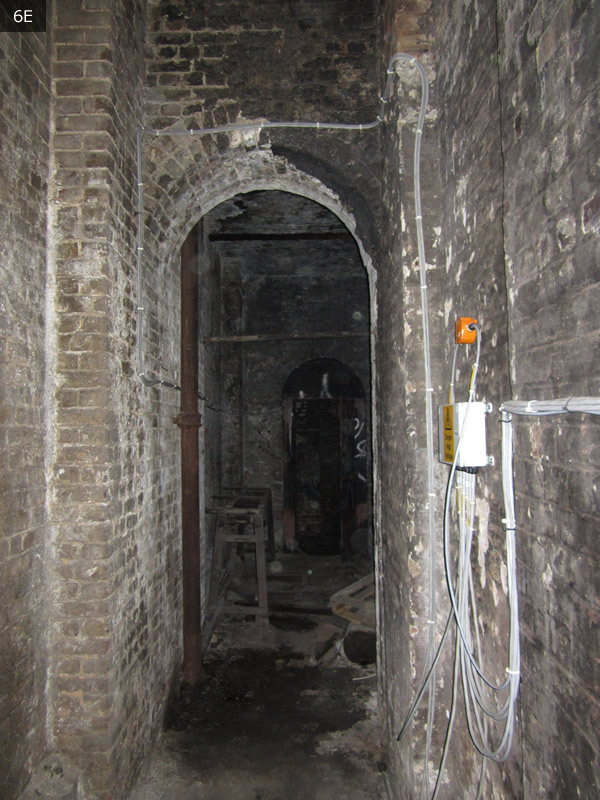 In this first part we plunge again into the labyrinthine depths (starting as JB did at Barbican) and investigate beneath Smithfield Market, emerging at Farringdon. In part 2 we’ll dig around Farringdon before heading down towards Snow Hill and Blackfriars. All the while we’ll be asking ourselves how the rail infrastructure that remains could be better used, to provide much-needed rail capacity in the city core. Or, how can it be safeguarded, and whose responsibility it is to do that. The current plan is for LUL to adopt the curtailed ex-Thameslink route to Moorgate to use as long stabling sidings, not least because its new S7 stock is too long for its existing sidings at Farringdon. Below, we revisit the option of a DLR extension from Bank to Farringdon, which may also be able to use some of the extensive rail alignments beneath Smithfield for stabling of stock. Indeed we feel the DLR Horizon 2020 Study for TfL significantly underestimated the benefits of this option. Given what we discover in our look around the tunnels, and the increasing likelihood of a Crossrail 2 route via Euston, it’s tempting to suggest that DLR extensions in the city are probably worthy of another look. Aldersgate St (now Barbican) in 1936. 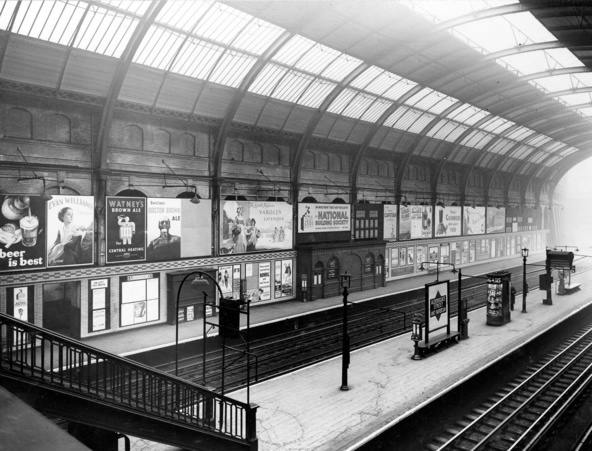 The splendid roof was removed in 1955 and it’s now sadly one of the gloomiest stations on the network. Photo courtesy of London Transport Museum. But first, let’s familiarise ourselves with the territory. The Farringdon area was railway border territory with lines meeting from north and south, alongside the Metropolitan’s own lines, and with several companies vying for trade ― both passenger and freight. The map below, taken from a 1961 Railway Magazine article, shows when each section opened. The Railway Clearing House (RCH) map shows the varied ownership; the lines up through Blackfriars were originally London Chatham & Dover Railway (LCDR) before this merged with the South Eastern to become the South Eastern & Chatham shown on the map. Smithfield Market goods opened in 1869, serviced by the GWR. The GNR opened its depot in 1874 and the Midland followed with its Whitecross depot in 1878. Not wanting to be left out, the Metropolitan opened its diminutive Vine St depot at Farringdon in 1909. Thank you to our commentators for pointing out that the term ‘Widened Lines’ refers to the route now used by Thameslink from Kings Cross and St Pancras to Moorgate. Such was the demand early on that the Metropolitan found it needed to widen its line from Kings Cross to four tracks, opening the new route in 1868. At Kings Cross there were connections west to the Met (and from there to the GWR) and north to the GN and Midland, and from Farringdon and Barbican south to the LCDR, not forgetting that the LSWR also ran services to Ludgate Hill and stabled its trains at the Smithfield Sidings just north of Snow Hill station. The tunnels were also built to Broad Gauge for GWR trains, so to some extent the Widened Lines tunnels are also slightly wider than we would now consider necessary, which helps give the impression of space apparent in JB’s photos. So, let’s start at the beginning of JB’s underground perambulation and track his footsteps. The Crossrail diagram below identifies the buildings demolished for the Eastern Ticket Hall at Farringdon, which lies at the west end of Barbican station. The tunnels outlined west of the station give a hint of the space beneath, and can be matched up to the other plans below. “IMR” refers to an Interlocking Machine Room, housing signalling equipment which Crossrail has moved to a new location inside the tunnels. The picture below is a view from Hayne St overlooking the west end of the Barbican ex-Thameslink Up platform to Moorgate, looking SW towards Smithfield Market and Lindsey Street. It is looking directly at the point at which JB took the first pic in his walk on the Widened Lines. This space was uncovered when the deck was removed as part of the Crossrail works (shown in the plan above), and the picture clearly shows the tunnel mouths that JB explored. 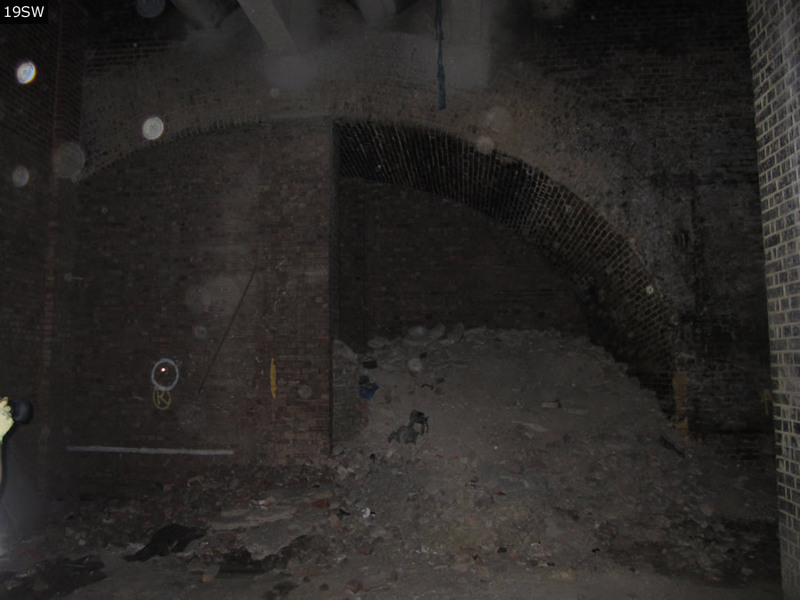 Tunnels at west end of Barbican, picture courtesy of fridgemonkey. The marvellous Abandoned Tube Stations website has a series of photos showing Barbican in the late 70s, including the same spot gloomy under its concrete decking. There is also a view of the quirky signal box at the west end of Barbican station, also demolished as part of the Crossrail works. 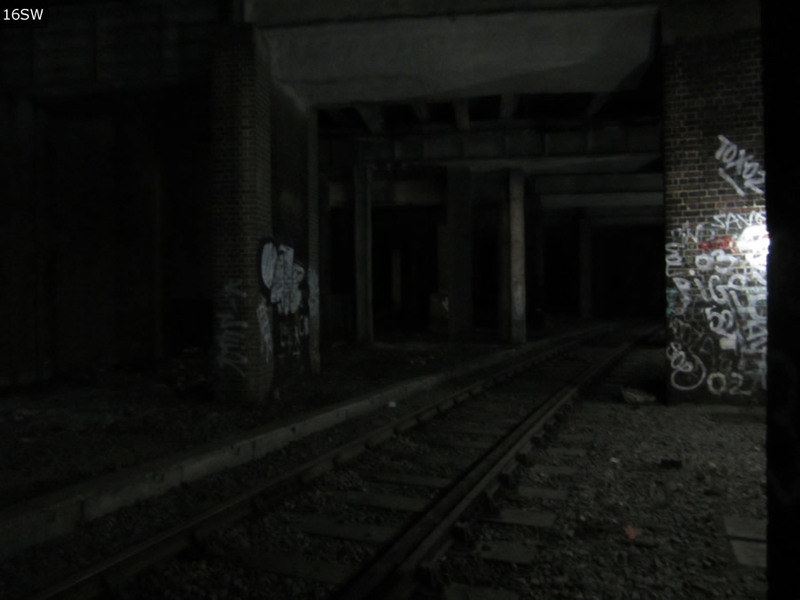 The underground Met sidings occupied the large spaces alongside the Widened Lines that JB marvelled at in his subterranean tour (pictures 8SW, 9W, 12NW). There were two sidings according to Harsig’s diagrams below, which extended a little under 500’ into the tunnel. I think it was No 1 duty at Baker St which used to fetch this train out in the mornings. We used to access the siding from Farringdon. You walked up the CWL [City Widened Lines] tunnel on the grounds that it was unlikely there would be any trains running. There was a repeater on the tunnel wall which you would glance at occasionally. We were told, “If it goes green, run! The tunnel was very dark and spooky. The tunnel lights were so weak they didn’t make much difference. You could hear the rats scuttling around. The siding tunnel was accessed through an arch in the running tunnel wall. There was always rubbish around where the cleaners used to spill stuff from the train. More intriguing were reports that the southern Met siding was used in the old Great Northern & City line days to enable loco-hauled stock to transfer between Drayton Park and Neasden Works, going via the Widened Lines to the Circle line and return. The route was Drayton Park to Finsbury Park to Kings Cross Main Line to Aldersgate (reverse) to Earls Court to Rayners Lane (reverse) and to Wembley Park and Neasden Works. 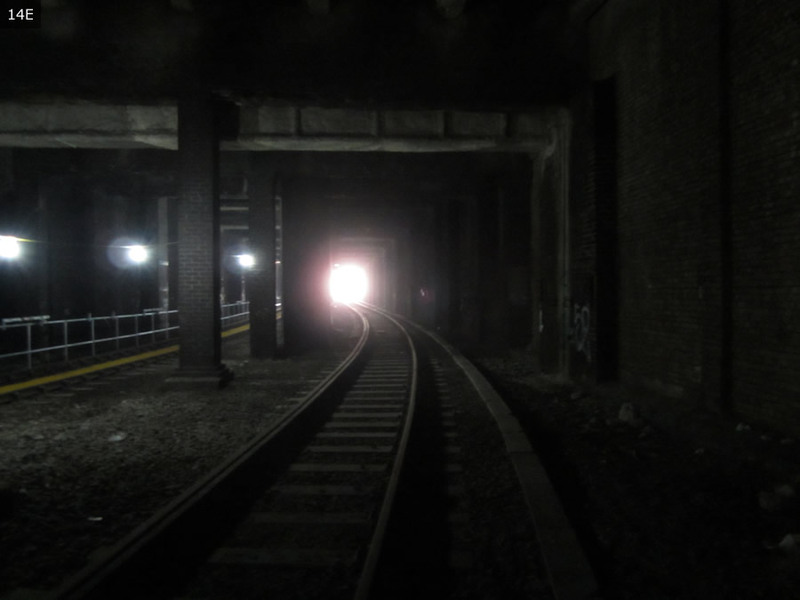 The reason was that the GN&C stock was too large to pass through the tunnels between Baker Street and Finchley Road. Much as though we’d love to know more, expect ephemera like this to crop up sometime in an LR Christmas quiz. Back to Crossrail, and the plans for the Eastern Ticket Hall give much more detail on the layout of the Widened Lines tunnels that JB explored. We’ve annotated the plan of the basement level below, which clearly shows the cramped office and stores up against the walls of the Met line tunnels, shown in JB’s photos 4S, 6E and 7E . What were they for, and when were they last used? 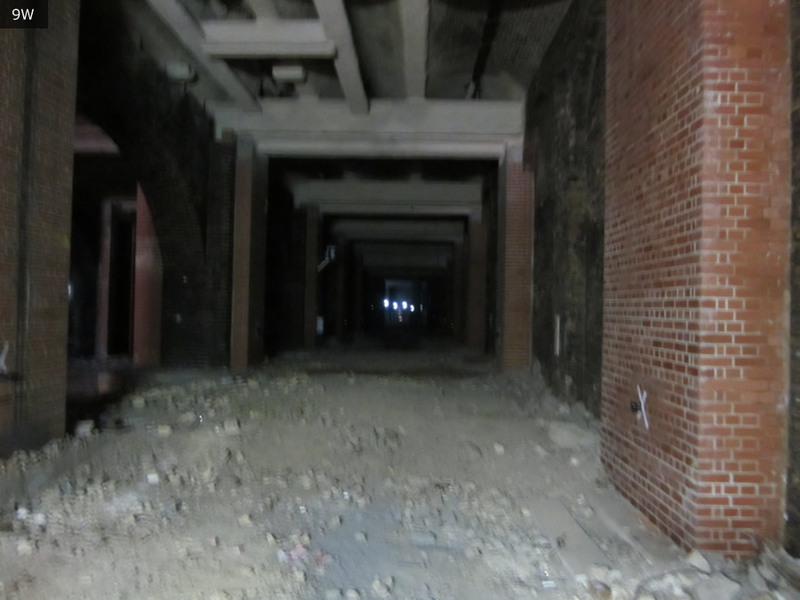 What also becomes apparent is the very large space to the south of the Widened Lines under Smithfield Market. 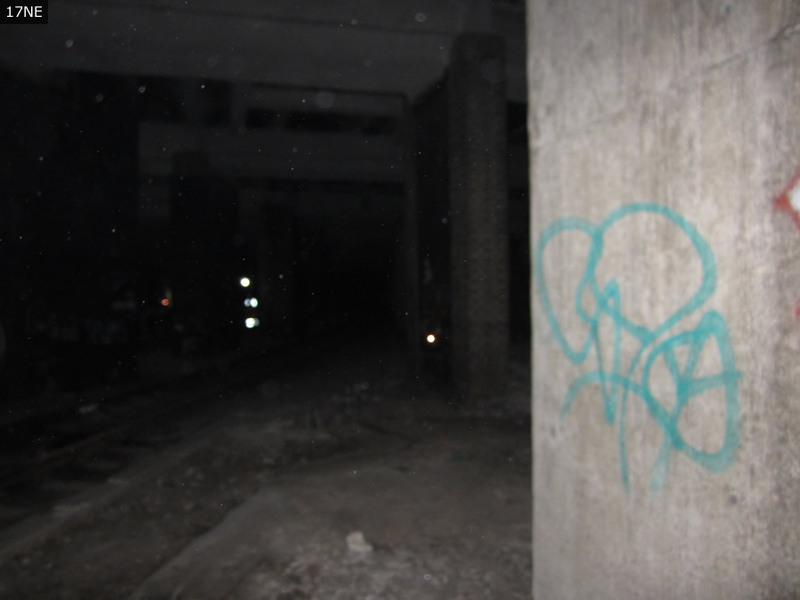 This was the GW Smithfield Goods depot and the access from the east marked on the plan above is clearly visible in JB’s 1W photo: the concrete graffiti-laden wall. 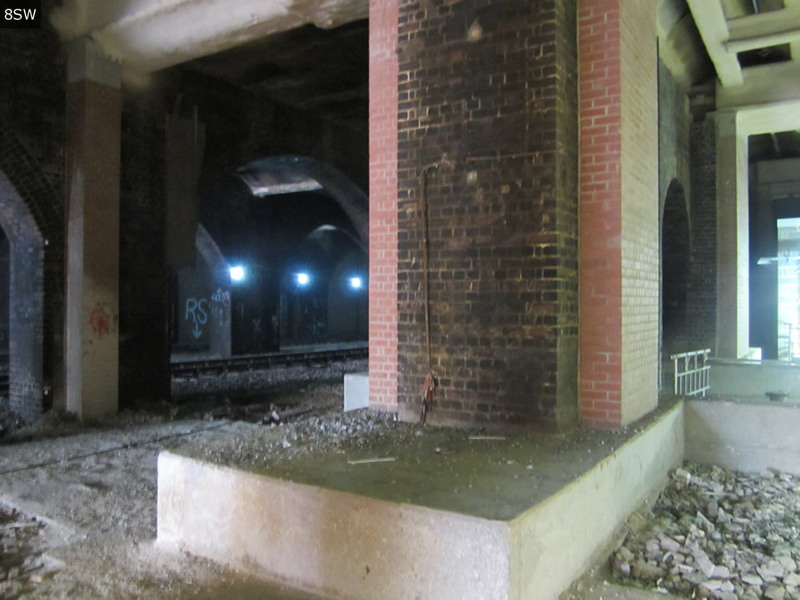 JB’s 10S photo was taken from a point marked on the plan above, standing where the northernmost Met siding would have been and looking across the other Met siding, the Widened Lines and to a bricked up arch, behind which would have been five tracks within the GW Smithfield depot. So at this point there are nine tracks beneath Smithfield, plus the two Met running tracks. 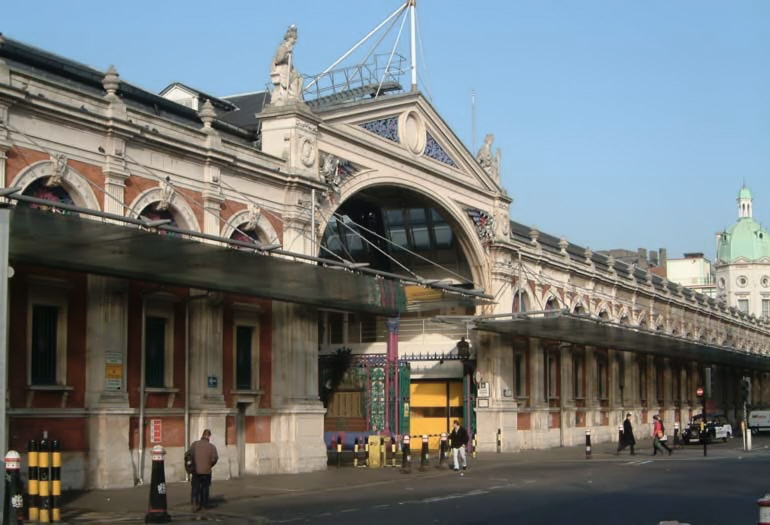 Smithfield Market is Grade II* listed and is therefore of national importance, and is still a working meat market open 4am to noon every weekday. 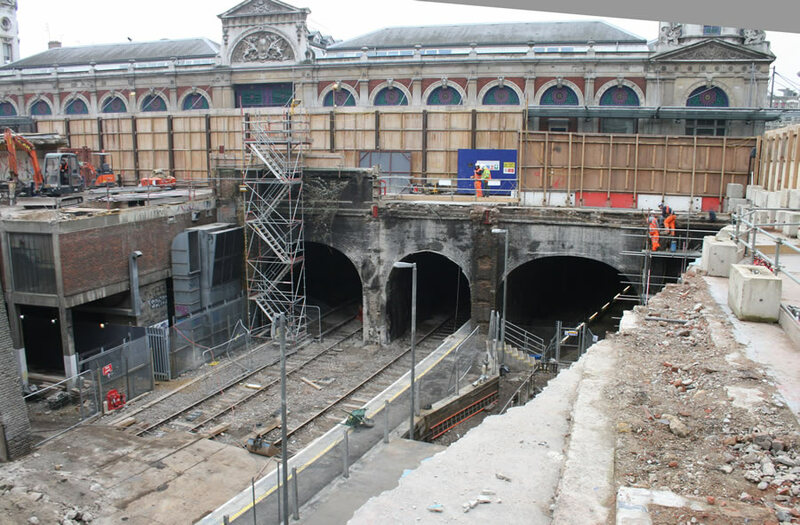 The Crossrail works required particular attention to heritage detail and their report presents a good historical overview along with some interesting snippets about the extent of Crossrail works authorised. The structures combine elaborate detailing with functional design as a wholesale market, and beneath the market buildings lay an extensive basement area enabling livestock to be brought to the market by rail, unloaded and taken straight to the market above for sale. The Smithfield Goods depot remained in use until the 1960s. The basement plan below has a wealth of detail and should be compared with the Crossrail plan above. For this we are indebted to GWR Goods Services – Part 2A – Goods Depots and their Operation written by Tony Atkins and published by Wild Swan. This book covers a whole host of GW goods depots in the London area, including Smithfield, Paddington, Brentford, Chelsea, Poplar and South Lambeth, and is highly recommended to LR readers. The plan does not show the Met running lines, which lie just to the north, but it shows that five tracks extended the length of the depot. 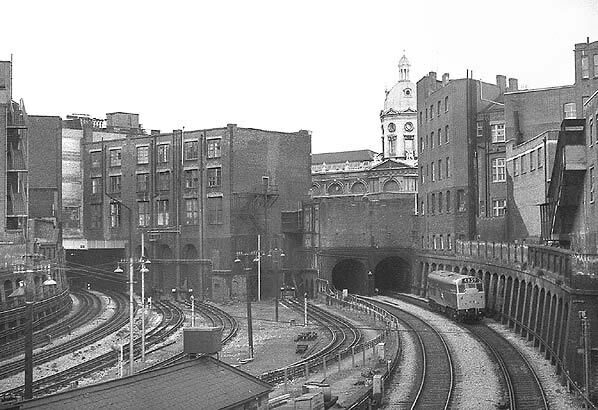 Trains came in from the Barbican end, and departed west towards Farringdon crossing the Smithfield Curve on the flat, and this junction had its own subterranean signal box. Wagons were moved using turntables and capstans, and needed to be efficiently worked to maintain the throughput: 200,000 tons were handled annually in the first part of the 20th century, and in 1929 the depot employed 667 people, second only to Paddington Goods. What also becomes clear is that the Met sidings we explored above originally served an island platform, used by the Met, with hoists up to the market above. The Met also had another goods platform opposite the signal box, in the triangle between the Widened Lines and the Snow Hill curve. Located on running lines, this can’t have been easy to work. 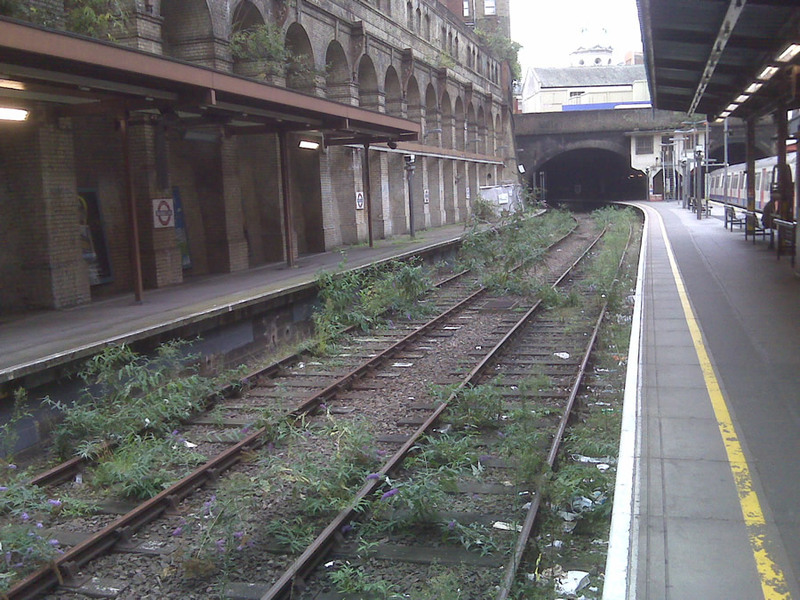 Presumably the Met facilities closed when it opened its Vine Street depot at Farringdon, and the platforms were removed and the sidings were then used for stabling. During the 1990s much of the basement area was altered to provide car parking and plant room facilities ― a mezzanine level was inserted, but a substantial proportion of the original jack arches and substructure remain. An intriguing twist is that the works authorised in the 2008 Crossrail Act include conversion of this car park into a worksite. 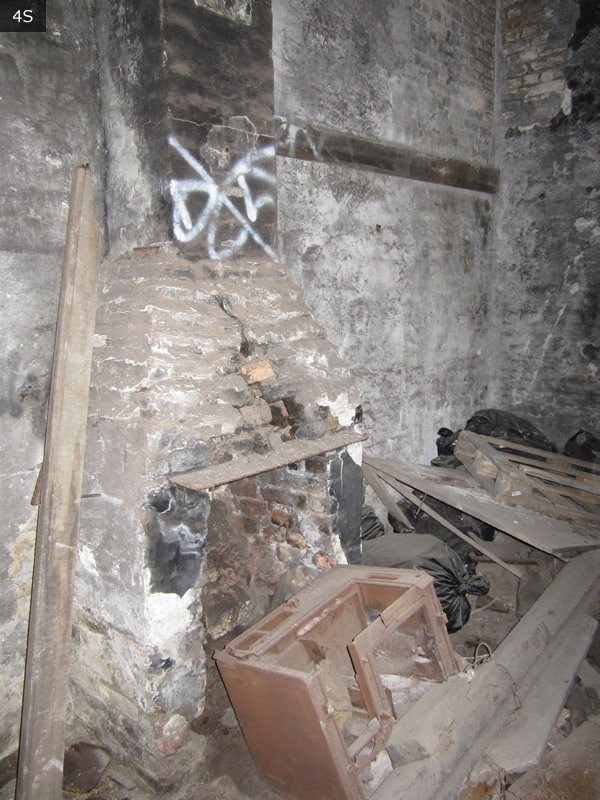 If that also required the removal of the mezzanine level, then the authorisation is already in place to prepare the basement for a return to railway use. More on this later. 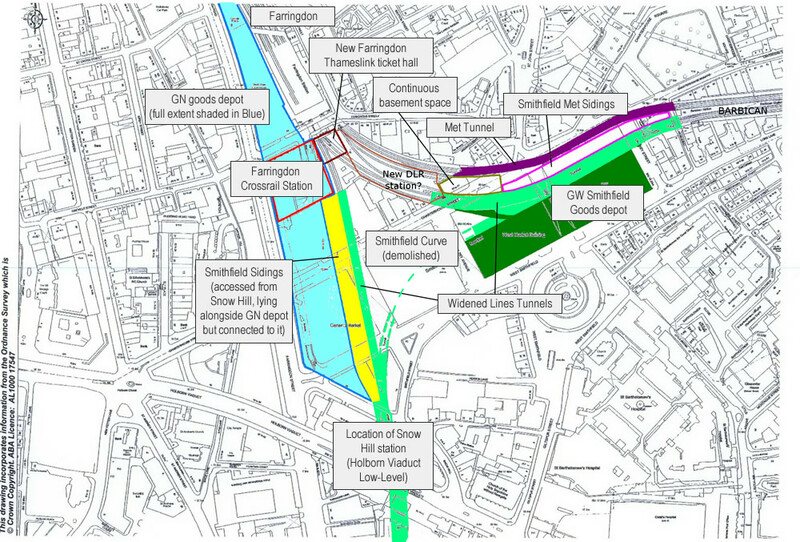 The Crossrail plan below shows the shape of the tunnels to the north, the Widened Lines alongside towards Farringdon and the erstwhile Smithfield Curve continuing south-west towards Snow Hill. Also marked on the Crossrail plan above is Fabric, the night club located below ground between the Met and the Widened Lines. It occupies the renovated space of the Metropolitan Cold Stores at 77 Charterhouse St, and includes a large below-ground room renowned in the clubbing world. This author briefly pondered the wisdom of donning the dancing shoes and setting forth on a fact-finding mission, perhaps also to recce the venue for the LR Christmas party. But, confident that many LR readers are also avid clubbers, we hope that their inside knowledge will help fill in some of the gaps. At 67-77 Charterhouse St, adjacent to Fabric, is an old market building, now the bar/restaurant ‘Smiths of Smithfield’. The rear of this building is in the middle of the photo below, behind the Met sidings at Farringdon, and the large wall suggests a substantial basement space. 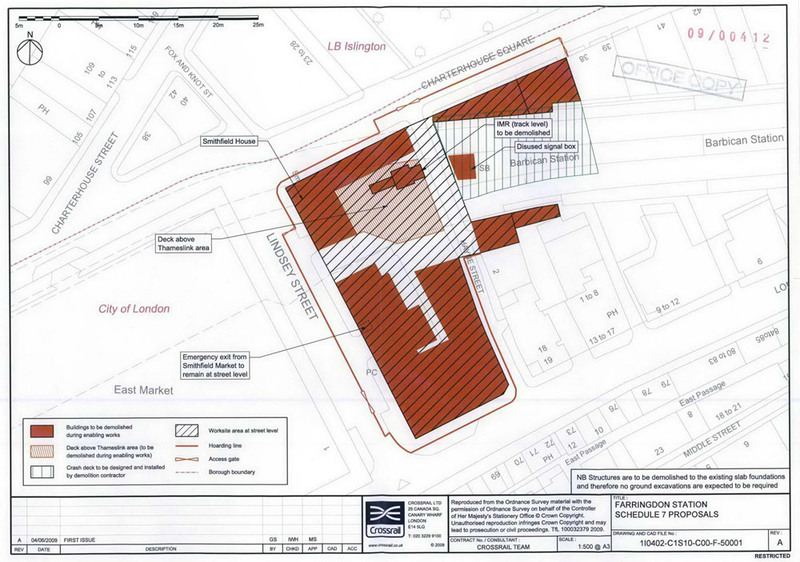 Adding to the mystery, in 2000 a planning application for 67-77A Charterhouse St was lodged with City of London, for a “Change of use from disused rail tunnel to an extension of night club to provide cloakroom and storage”. Which bit of tunnel were they referring to? Eagle-eyed readers will of course have spotted that this property is in London Borough of Islington, yet the planning application was with the City of London. Indeed the boundary runs along the middle of Charterhouse St, and this indicates that the basement space extends across the council border and up to the Widened Lines. Intriguingly, does this mean there is essentially continuous basement space underneath Fabric and the adjacent building and therefore all the way to the retaining walls at Farringdon? If so, is there any potential for the three Met sidings just east of Farringdon to be extended through to the alignment of the underground Met sidings west of Barbican? 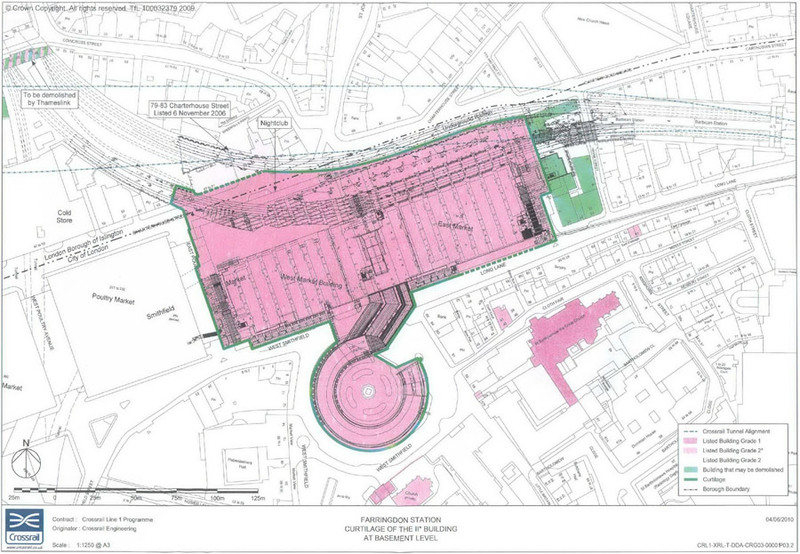 The Crossrail plan above clearly shows that the Smithfield Curve no longer exists underneath the Poultry Market, although the truncated stumps remain at the south and the east end. 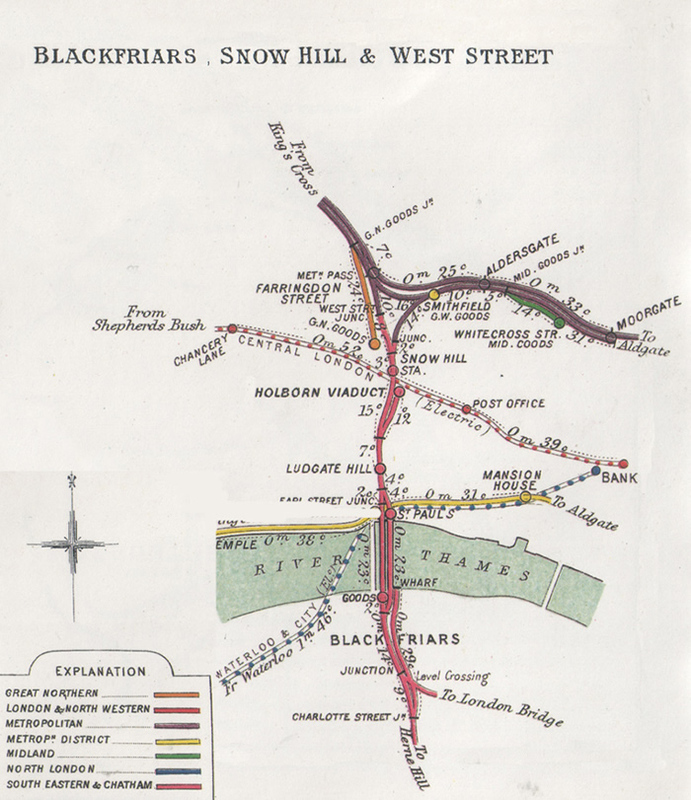 So, let’s try and nip another Blackfriars-Moorgate discussion in the bud: trains are no longer able to travel east from Snow Hill (City Thameslink). Rebuilding this curve would entail the demolition of the Grade II listed Poultry Market. It’s not going to happen. The Smithfield Curve was opened in 1871 and London Chatham & Dover Railway (LCDR) trains ran up from Ludgate Circus around to Moorgate. Services were withdrawn in 1916 and the Curve finally closed in 1927. 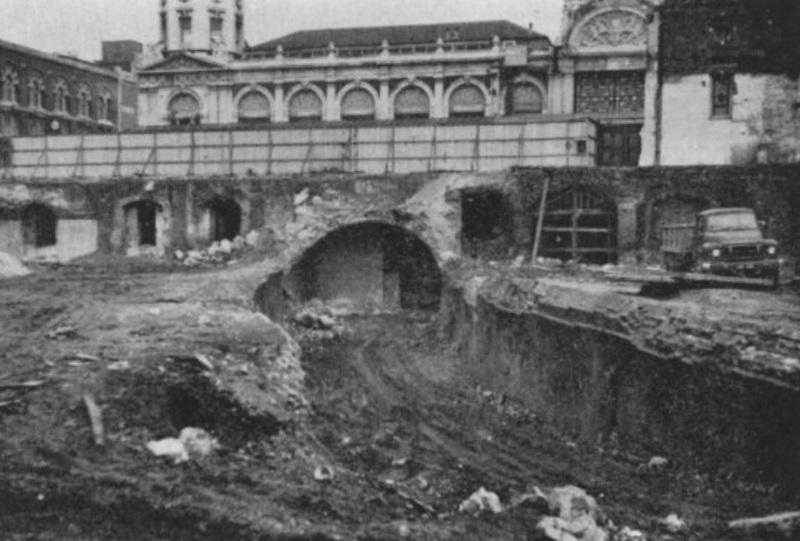 As this 1961 Railway Magazine (PDF) article describes, a severe fire in 1958 destroyed the old Poultry Market, and the photo below shows the Smithfield Curve uncovered during excavations for the new building. The tight curvature is clear which, as one of our commentators kindly pointed out, limited the use of the curve to non-bogie stock. Thus even if the Smithfield Curve still existed, modern coaching stock would not be able to use it. JB’s photos show where the Smithfield Curve branched off from the Widened Lines beneath Grand Avenue in Smithfield Market: 14E looking east back towards Barbican, 16SW and 17NE. 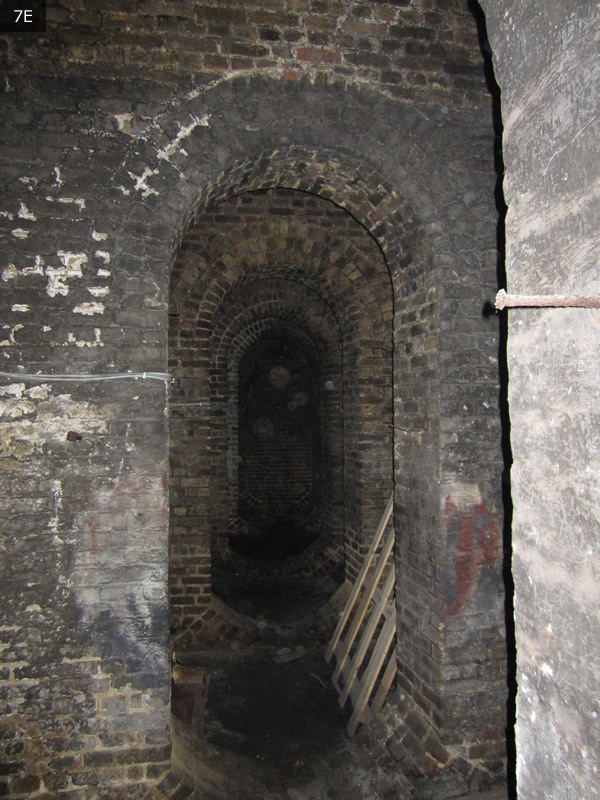 The picture above also shows the bricked up tunnel portal seen from the other side in JB’s photo 19SW. 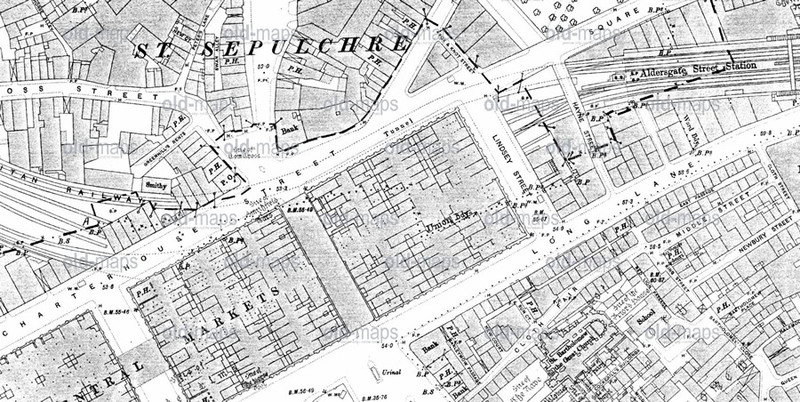 The arches to the left and right lay beneath East Poultry Avenue and were connected through to the railway tunnels/sidings behind, as shown in the Smithfield car park plan above. 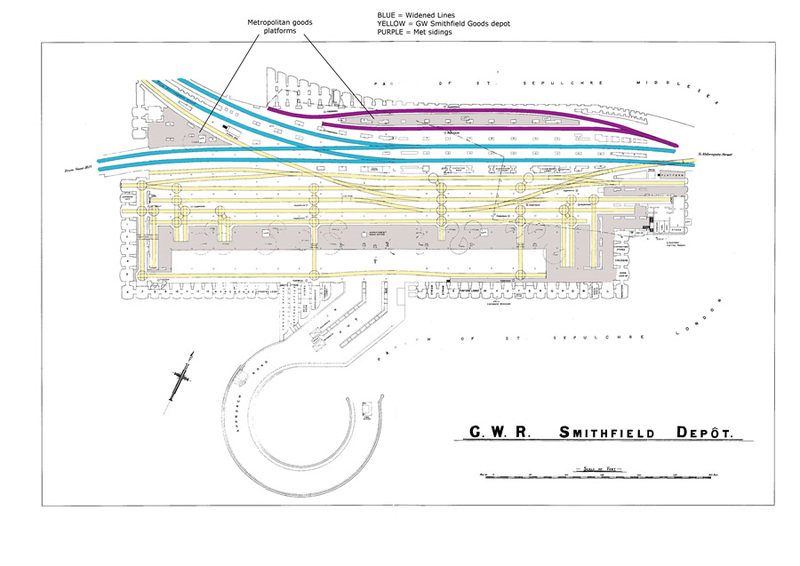 But it would be interesting to see whether the alignment of the line from the GW Smithfield depot is still clear. As the Smithfield plan above makes clear, this was the departure line from the depot and crossed the Smithfield Curve on the flat. We’ll continue our exploration west to Farringdon and then south to Snow Hill in Part 2. 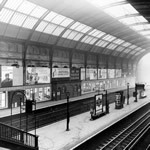 This author recalls a conversation with a railwayman who, when surveying the area around Farringdon in the late 1970s, was astounded to discover the extent of railway lands there. Bit by bit these alignments are being nibbled away. Part of this could be the well-documented lack of strategic rail planning in London, with responsibility diffuse and contested between DfT, TfL, NR and the TOCs. Part could also be lack of knowledge of what is actually there, which is a gap we hope to address in these articles. The current plan for the ex-Thameslink route from Farringdon to Moorgate is for LUL to adopt them, to provide invaluable stabling in the city, not least because the new S7 and S8 stock is too long for sidings such as those at Farringdon. The August 2011 edition of Underground News has details about the track and signalling changes on the sub-surface lines, of which this will be one component. There will be a long stabling siding leading off the Met lines where Farringdon Sidings are now, and the siding will be double track through Barbican station. Is this efficient use of the space, however, given that stock will have to be stabled end-to-end? How much stabling is actually required? And could this be provided at Moorgate, where removal of the Thameslink platforms could yield four stabling roads, plus more in the tunnel immediately west? Whatever, the discussion may be forced into the open as a result of a low-level spat between LUL and the City of London on who actually owns and has responsibility for the tunnels. Details are sketchy at the moment and JB is investigating further, but the issue appears to be over the lease for the land and the precise meaning of the term “an operational railway”. More details as we get them. We’ve looked again at the options analysed in the DLR Horizon 2020 Study, prepared for TfL by Arup in 2005, which we previously reported on here. A DLR extension west from Bank is desirable because it helps even out traffic flows, and the Study examined several options, including to Barbican via Moorgate and the ex-Thameslink tunnels. As we can see from our explorations under Smithfield, the tunnels do appear to fit DLR purposes very well: they are large, the alignments are clear, and there will be space just east of Farringdon station for DLR platforms once the Crossrail works are complete. Platforms here would also offer very straightforward interchange with the new station, and a new station entrance could also be provided off Charterhouse Street. 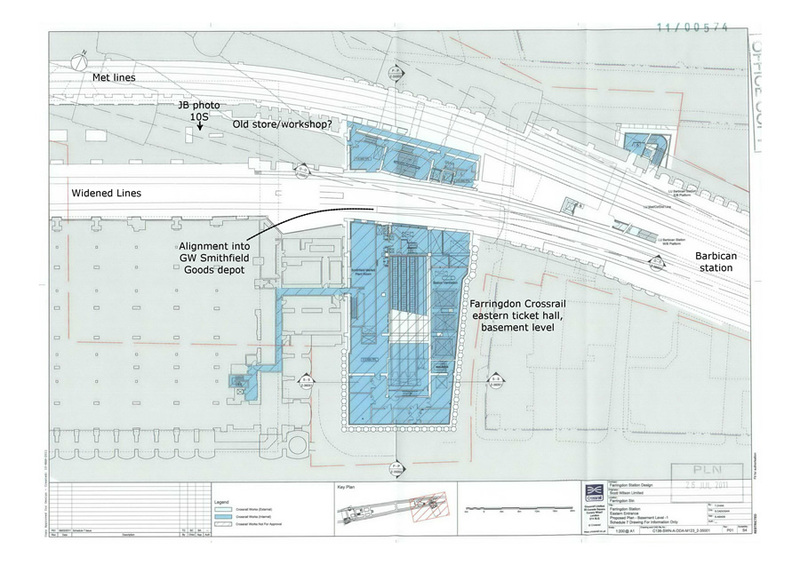 Furthermore, the ex-GW depot in the basement under Smithfield Market may be able to provide stabling space, and the authorising works to remove the mezzanine deck in the car park may already be in place in the 2008 Crossrail Act. The alignment of the Met sidings between the Met and the ex-Thameslink tracks could also be re-used, and overall the tight curves and shorter siding lengths will not be a problem for DLR trains. Granted, plans for a DLR extension to Euston gather pace as HS2 looms. 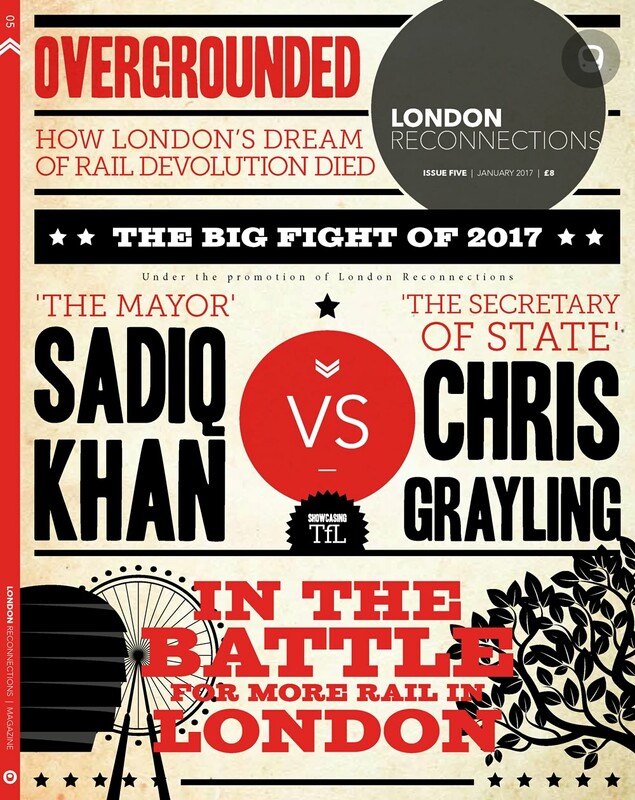 But so does the business case for Crossrail 2 via Euston. Arguably Crossrail 2 is a higher priority, and this is likely to weaken the business case for a DLR extension to Euston. Indeed, the 2005 Study did not look at a Euston DLR extension, and therefore we don’t know how this stacks up against the other proposals. Certainly DLR to Farringdon would be far cheaper, and can be made cheaper still by relinquishing an interchange at Moorgate, instead going directly from Bank to Barbican. There is a strong case for revisiting the study and reassessing the BCR of each option and, in the meantime, safeguarding the alignments. Indeed, safeguarding alignments is something that is rarely exercised by strategic rail planners, and is a theme we will return to. In Part 2 of this subterranean journey through this intriguing part of London, we emerge west from the tunnels into Farringdon before heading south to Snow Hill and Blackfriars, and we will see how the loss of rail alignments through Blackfriars, Snow Hill and Farringdon now presents a significant capacity constraint for Thameslink. It seems Fulsome Farringdon has turned into waterlogged Farringdon following a burst water main a few days ago . And after being told the problem had been cleared up it returned today to affect Thameslink services . This incident and indeed the problems at Finsbury Park do raise questions over whether plans for the Thameslink upgrade have a few issues not covered? 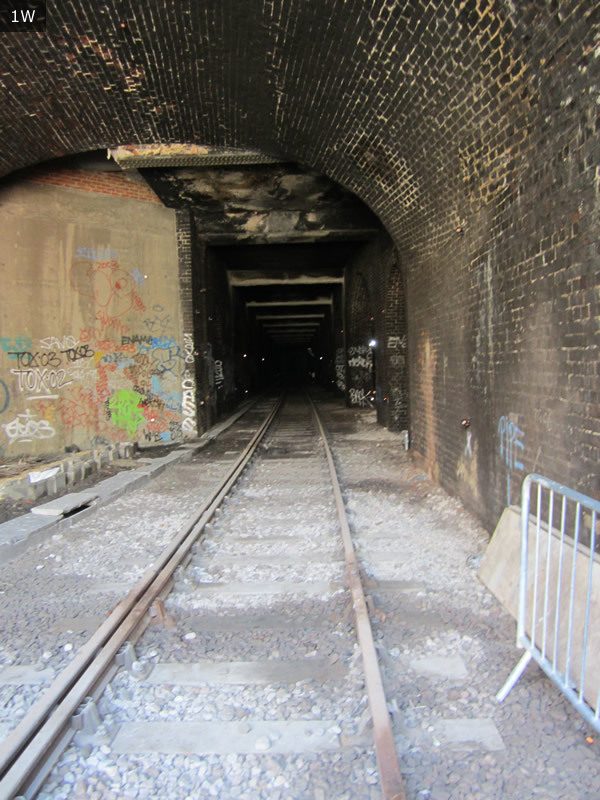 This problem at Farringdon raises the question as to whether the Snow Hill tunnel should have received a bigger upgrade more in line with the upgrade the Connaught Tunnel has received for Crossrail ? As for Finsbury Park well major station upgrades seemed to be done for original MML route but not for the GN route – surely Finsbury Park should have received a London Bridge upgrade rebuilding both mainline and underground as a single project . I’ll quickly sum up what’s happened here (although not convinced a comment on an article a few years old is most appropriate!). Cue someone allegedly turning the water back on over Saturday night/Sunday morning, causing the water level to rise too high and so the service was suspended on Sunday, with the call made later to run an altered timetable on Monday. At one point on Sunday the water was 1 meter deep! It didn’t help that the track at this location is lower than the water table, so water bubbles up through the drains and comes in through the walls. On Monday, the fault was fixed, the pumps removed the majority of the water and a special loco with vacuum were brought down from Doncaster to help the clean up. Today (Tuesday), service resumed, but a second pipe has been found leaking now which is again causing issues. Service through the core has been suspended tonight until 6am so that more work can be done. @ Anonylon – don’t we all just love Thames Water and their pipes!? Shades of similar nightmares affecting LU but where everyone thinks it is the railway that’s incompetent rather than the people who “own” the water. Thanks for the info on what’s happened – always nice to get an insight. Melvyn, upgrading the Snow Hill tunnels would not have made the slightest difference in this respect, as it is Clerkenwell No. 1 that is suffering. Why no ire directed at Thames Water? 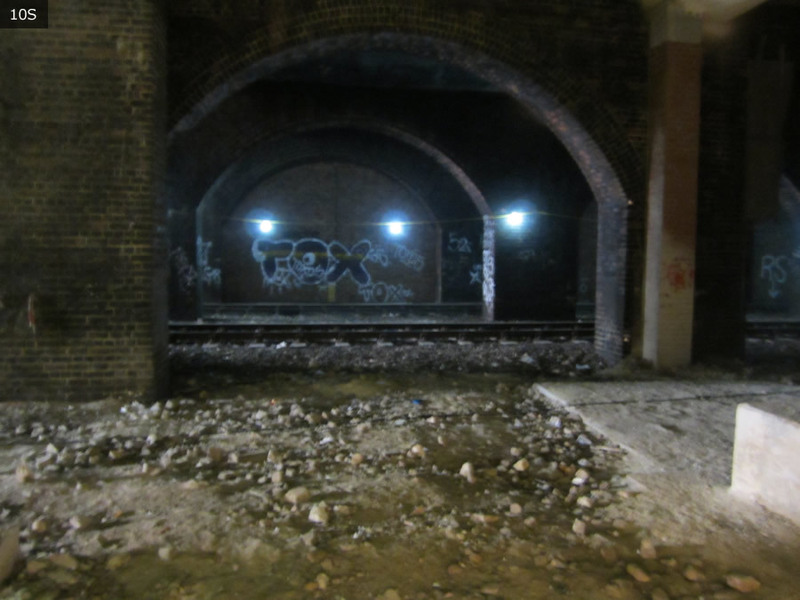 The dip under the gridirons at Farringdon is notorious for flooding – been that way for a very long time. Core to be shut from late tonight until Monday probably. Multiple leaks have been found, and there’s still more it seems. 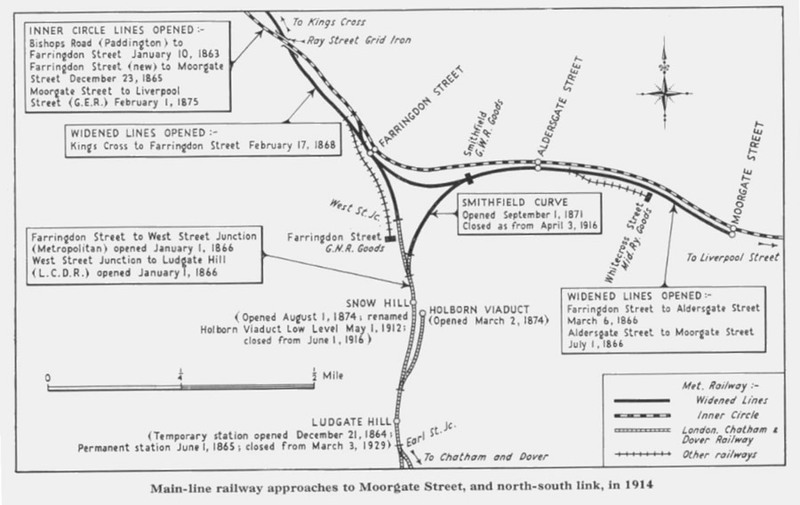 And more than fifty years before that, the same section of line was subject to flooding – even before it was completed. 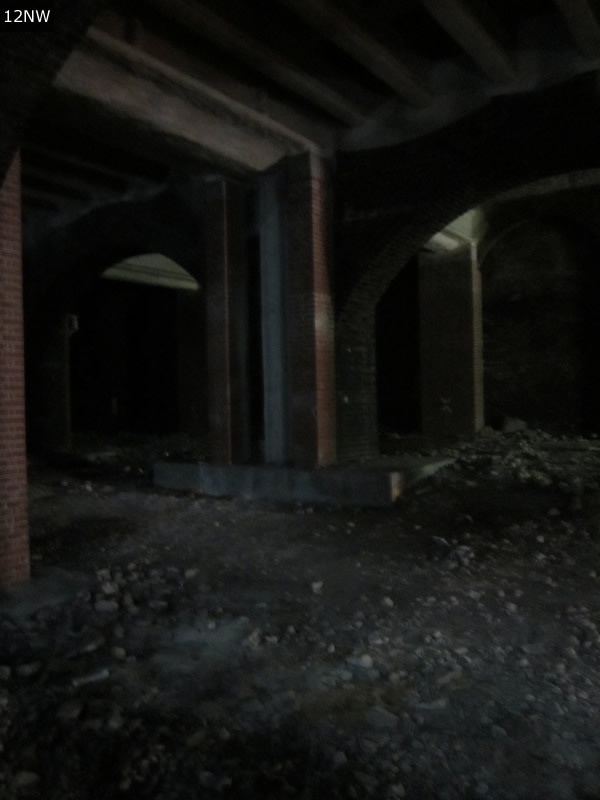 There’s a nice couple of new empty tunnels nearby, perhaps they can drain the water into them! Tunnel flooding still affecting services at Farringdon. @ WW I fully put the blame on Thames Water especially given the amount of work that has been done in Farringdon area for Crossrail but that may not be where burst has occurred. As usual blame is being put on Govia and yet they have only taken over the franchise ! The real question is why is media not going after Thames Water for interviews ? Given how importent this section of route will be in a few years time questions as to its resilience need to be asked especially when you remember the Fleet River flows down Farringdon Road/ Street . @Melvyn – “especially when you remember the Fleet River flows down Farringdon Road/ Street” – depending I suppose on which map you are looking at, I suspect you meant to say “under” rather than “down”. What I do know is that the immediate area received direct bombing hits during the war and despite the time elapsed since then, it is possible that the main has finally given up, regardless of patching up at the time and since. Indeed, the amount of recent rebuilding in the area at street level (and below) could have triggered the problem. It would be unfortunate indeed if the nearby Crossrail works were to be implicated, for example. It appears that a drainage issue has been rectified – definite signs of light at the end of the tunnel (pun intended…). Re Graham F et Al. They have apparently found 5 separate leaks so far (source BBC) fixed them and water is still emerging. The temp timetable was Thursday Friday vaildity which give the following weekend I suspect the closures is until further notice. Hunting for further leaks probably means visually inspecting where the water is emerging through the brick work to give those at road level a better chance. One burst has washed away the gravel supporting other pipes in the vicinity causing further new leaks. Some of the smaller leaks only got noticed with the big one as it overloaded the drainage /saturated the ground locally. Construction work locally (not just CR or Office buildings but has there been any work to other utilities especially electricity)? Apart from the time-travelling, the train I actually caught was, of course the real 1st train – the “Bedford” – it was the nominal 17.12 departure from Blackfriars. So it is possible then that another utility e.g. electricity, gas caused the initial problem? I can see fun times ahead with multi-million pound claims with multiple defendants going to court for the cost of the delay and various parties arguing that the damage is “too remote” – it isn’t of course. By the way, I do think this is the one really big hard-to-argue advantage of a fragmented railway. In BR days they would be hard pressed to put in a claim – and in any case it would be one nationalised industry claiming off another. Now Network Rail can point to a very real cost to Thames Water and demand compensation and go to court to recover the money if necessary. Thames Water can argue it isn’t a real loss that can be quantified – but undoubtedly Network Rail can argue that, whatever the overall picture, it is a real loss to them. If Thames Water are fully aware that leaks lead to multi-million pound claims they will have a big incentive to keep their pipes in good order and monitor them. Of course this probably means more roads being dug up but one has to accept that. Discovered this site plotting the course of the Fleet, which in the Farringdon area ran somewhat to the west of the Metropolitan Railway. TW might have caused original problem, but the story might imply that NR hadn’t kept its own drainage working adequately, so the flooding remained problematic. The implication could be that the scale of any compensation to NR might be abated to an extent. “The utility said the incident was caused by a blocked pipe, and blamed “a lack of maintenance”. As a another refugee from the PPP Attribution process (been trying to figure out who you are WW !) this rings bells. Can’t remember the exact details but the allegation was that a drain hadn’t been maintained in a similar flooding circumstance. Fortunately for former Metronet, fairly recent documentary proof of drainage condition was available, and the reason for the drain being blocked was the sheer amount of crud washed out of the ballast by the burst. It also clogged the emergency pumps put in place to mitigate the flooding. A great irony was that one of the four principal companies in the Metronet consortium was … Thames Water. There were allegations that Metronet billed Thames Water for fixing water leaks that Thames Water were under a duty to fix anyway (without charge) and that bill got passed to London Underground under PPP. On the positive side it has also been suggested that that Thames Water were keen to fix leaks affecting the Underground as they got paid for it and at the same time improved the asset condition of Metronet’s infrastructure. Based on the NCE article above, it could even be that it was TfL buses or poor road maintenance which created the original damage to the TW pipe under the bus lane (though could that be proved?). Where does liability then reside for each element of the topic, in terms of original damage or later problems and losses? TfL Surface Transport (road maintenance or buses element?)? The bus operators? Utility? NR? NR drainage? So far, not LUL. Could be a complex legal case. Moral? : be a lawyer, not a transport owner/operator. Problems continued today but according to latest reports Thames Water say Network Rail is to blame for not cleaning its drains ! Time for pass the parcel? GTR have suggested they’re staying out of it. Don’t blame them really. Jeffy, I am going to speculate (for those watching) that 2) + 3) are linked. There will be a big bun fight between NR, TFL & TWA over ownership of the Vine Street drainage. GTR should sit back, as they are going to get 7 figure suns as recompense. Worth viewing the photos on offer. Some businesses have still not yet reopened as a result of the damage. Mind you, the area has fairly recent form with the underground relief branch of the River Effra below the road concerned itself flooding more than once, despite the ‘relief’ being specifically constructed to avoid it. Sadly, it’s actually very difficult to ‘maintain’ a buried water main, especially in a densely developed area. TWUL (Thames Water Utilities Ltd) used to have patrols that followed the routes of the really big mains (probably still do) mostly in order to watch out for rogue contractors who might be digging perilously close to said mains. Small mains (100-150 mm) can be replaced fairly easily by ‘no-dig’ methods. Medium sized ones, e.g. 400mm, just have to be watched and repaired when they misbehave, then bypassed with a brand new pipe when they fail just that bit too often. The culvertisation of the river Fleet would not have helped in the circumstances. The gravels of the Fleet valley will be carrying a fairly large flow of water anyway, trapped above the London Clay. In its natural state, the Fleet will have acted as an overflow drain for this flow. In its current state, the Fleet will still pick up some of that flow, but only at the points where this was provided for. The burst main will have added a big chunk more of water to that gravel layer. As it is very restricted in where it can go, the railway tunnel provided a handy outlet! I live near the top of a hill, & there is a spring somewhere up the adjoning/across-the-end road. Always come out in winter. About 10 years back, the gas people dug a big hole – which immediately filled up. They had to wait until May, in the end, to fix it. I see after recent rain, it’s come out of a slightly different place again. And this is just the headsource of a small spring, not a major flow. The report into the Old Street incident said that TfL do as well. Unfortunately NR didn’t, and the builders had no idea there was a tunnel anywhere near them. The line in question doesn’t even appear on the Tube map any more! What I found so frustrating about the Old Street incident was that no-one realised there was a railway under the building site, especially after a test bore had hit something solid. From one look at Carto Metro, it’s pretty clear that the most likely solid thing would have been the Northern City Line. What ‘Old Street Incident’ ?? It really isn’t on to start mentioning things expecting everyone else to know what you are referring too ! 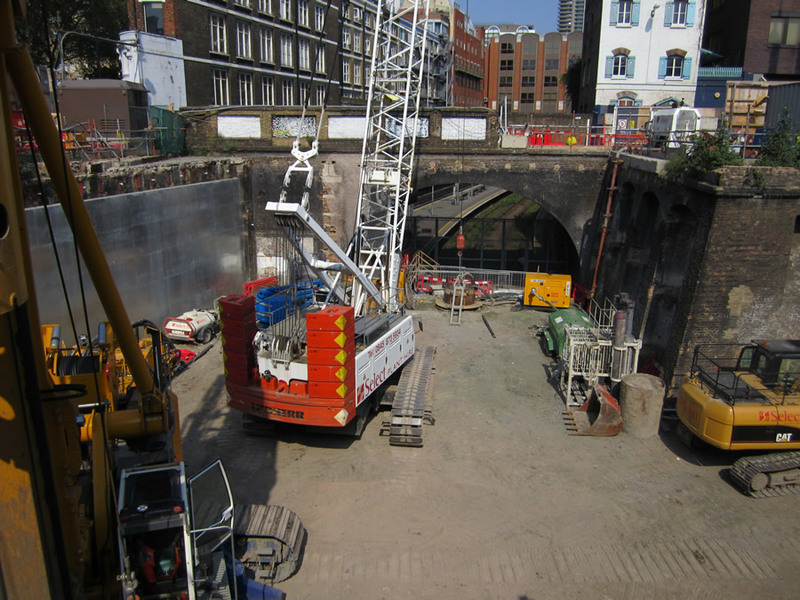 8th March 2013 Piling rig from a building site in East Road, Hackney, 13 metres above the tunnel penetrated and obstructed the line between Old Street and Essex Road stations. Not sure what happened to the plans to build medium rise flats above replacing the string of low rise post WW2 development that follows the line on the NCL. The first the contractors realised they had hit a rail tunnel was the arrival of NR and BTP on the building site! The RAIB did note, somewhat drily, that copious information about what and where the GN&CR was would have been only one Google search away, if anybody had been the slightest curious. @Greg. The historic water supply of the City was apparently based to a fair extent on those localised sources of water (usually associated with a man-made ‘conduit’- still apparent in some street names). I can only surmise that they were springs (like your local one) supplied from lenses of gravel within the mainly clay overburden (‘perched water-tables’ in the industry jargon). Sorry, end of aqueous sideline discussion! All true but (of course) not the whole story! Yes,overburdens of gravel and other water-bearing strata form the subsoil of the greater part of inner London,sitting atop the London Clay,having been deposited by the Thames as it made its way to the sea. However below the Clay lies the (water-bearing) Chalk which has ts own water-table,fed by rains falling on the chalk exposures North and South of Town. The upper water table was used extensively for industry,industry which sat directly upon,and polluted their own water supply.As industry has declined,but left the water unusable,the water-table in the gravel has been rising,and is now at the level of the deeper Tube tunnels,and acts as a limit to piling-depth in some situations. Conversely,the water in the lower water tale,by dint of having fallen thousands of years ago,and being filtered through miles of chalk,is ideal drinking water and is used as such.Consequently this water table is falling. Work has now started to install the new double junction east of Farringdon, linking the Circle line into the former Widened Lines tunnel. This will enable trains to stable down as far as Moorgate, avoiding the trip out to Wembley Park sidings. Does that mean that they will be blocking off the old Thameslink platforms at Barbican, so the taggers can’t get at them? So where is this new junction? I’d got the impression that the former track area between Farringdon and Barbican stations was going out of use. The Thameslink route to Moorgate has been abandoned. Also the three sidings east of Farringdon, which like many were too short for the new Circle line trains. The new junction east of Farringdon will link across the sidings site to the old tunnel mouth. @ Taz – I am being picky here but I sincerely hope the land and associated obligations has been properly transferred from Network Rail to London Underground and not just “adandoned”. I also trust there has been a proper process of asset removal by NR and then due diligence around asset condition etc so there are not any nasty surprises lurking for LU. @WW – I have no idea, but the last part of Crossrail to be tunnelled was beneath this line, with grout shafts and de-watering wells sunk in the former route, which have to be filled. Farringdon east ticket hall is also being built above the route to link with Barbican platforms. @ Taz – I understand the Crossrail works in the area having been fortunate enough to visit site and look down over Barbican station. I also know the section through the City has seemingly been the toughest bit of tunneling for Crossrail. I wasn’t expecting you to know the detail around property transfers. Having had involvement in such things I was more expressing hope that it’s all been handled properly given the likely importance of the new sidings to operation of future SSR services. From carto metro I note the single track through Barbican station. Is there some operational benefit I can’t see in this, as it costs a pair of turnouts that otherwise might not be required. Or has the former Pl.4 alignment been obstructed (either temporarily or permanently) by Crossrail work? That does look odd. if the single track had been through Platform 4 I would have guessed the eastbound alignment was being taken for widening of platform 2 and/or measures to stop trespass. But carto metro shows Platform 3 remaining and platform 4 going. Looking at Google Earth, the Crossrail works may have put a structure of some kind through the track bed at the west end of the station, but it’s far from clear from the aerial view alone. Not sure, it doesn’t make complete sense to me either but looks like a horrible multi-factor compromise. There was some discussion on the recent Bakerloo sidings / long overrun tunnels about the new Met sidings around ensuring not too many trains could get trapped if one train wouldn’t start up, therefore it effectively looks mostly like a single siding with some passing loops for the trapped train issue and the ability to leave a dead train towed/pushed in at the Farringdon end without losing the rest of the functionality. It looks like they aren’t looking for a massive amount of extra siding space overall. If they really wanted all the max siding space then double track in the stations and another 2 sets of scissors (an extra 5 point ends over what is porposed) probably would have the result. Any Idea how they will enter the sidings? Presumably train going eastbound terminates at Farringdon then straight into the sidings rather than terminates at Aldgate then runs ECS westbound to Farringdon then reverses in to the sidings. Is there plan to do anything more sophisticated at Moorgate with siding access post resignalling? e.g. is the current solution being signalled with mostly recovered equipment till the resignalling happens when the track layout may change? Handpoints within the sidings currently perhaps? Hence the need for a bit of safe space alongside the switches for lever and operator rather than another line. I can see the point about not trapping units, i.e having to go all the way to Moorgate to get past a failure and back out again. I expect a small daytime reserve will cluster at the Farringdon end, while a full complement for overnight stabling could stretch all the way to the terminus. Clearly there were interlocking alterations to existing signalling as the new double junction and scissors at Farringdon bear little resemblance to the previous single lead siding connection. They had the opportunity, there, for no significant extra cost to make the old Eastbound widened lines track, the “inner rail” ( i.e. 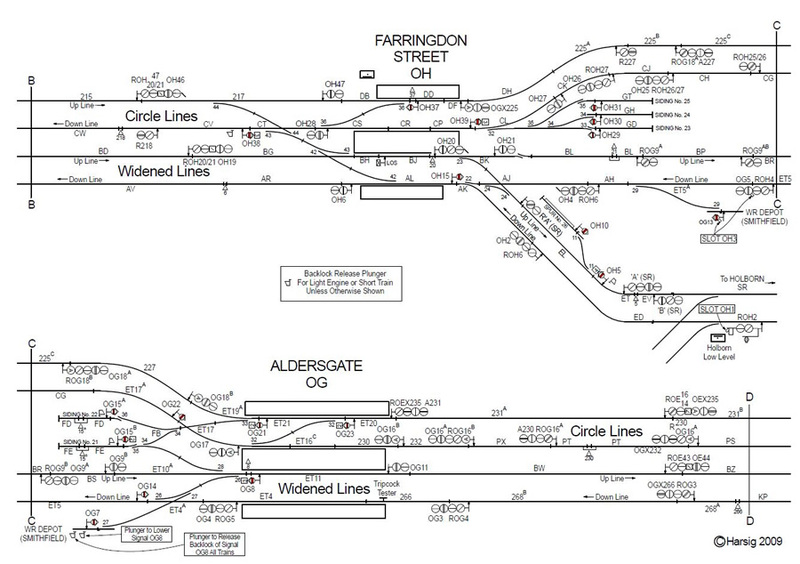 W-bound Circle ) & make the current inner rail a reversible line & thus re-arrange the Moorgate sidings. Thus giving extra storage space & a sensible reversing arrangement for Moorgate terminators. Whilst the connections are being installed before resignalling, they are clipped out of use. The sidings will be completed after the new signalling. They will hold 10 trains, a major site for S7 stock, only the two District line depots holding significantly more. Doubt if the DLR would of extend to Barbican. Possibly one platform which is been disused could be used as a bay platform for Hammersmith & City Line trains coming from Barking or Metropolitan Line or Hammersmith & City/Circle Line coming from Baker Street, Paddington, Hammersmith, Uxbridge, Amersham and Watford. And the other track and disused platform to make space for art displays and new advertisement boards. Why bother resurrecting an old topic when the infrastructure changes for the planned stabling sidings are almost complete?